Or as low as $48.33 per month over 12 months. Apply Now. Play music, TV, movies, podcasts, radio, audiobooks and video games. Experience rich, detailed sound that fills the entire room. Play music hands-free with Amazon Alexa. Everyone can do it. Or as low as $74.92 per month over 12 months. Apply Now. Or as low as $16.67 per month over 12 months. Apply Now. The smart, compact soundbar for your TV. The new Sonos Beam with Amazon Alexa. -Play music, TV, movies, podcasts, radio, audiobooks and video games. -Experience rich, detailed sound that fills the entire room. -Play music hands-free with Amazon Alexa. Everyone can do it. -With software updates, your listening experience will always improve. -Set-up is quick and easy, with only one cable to connect to your TV. -Connect Sonos speakers wirelessly to create a home sound system. -Play sound from your Apple devices to Sonos with AirPlay, and Ask Siri to Play music all over your home. Experience incredible sound while streaming music, watching TV and movies, enjoying podcasts and audiobooks, or playing video games. Put yourself at the centre of movies, shows, music and games with rich, detailed sound that fills the entire room. Thoughtfully designed for your home. At only 25.6 inches long, Sonos Beam won’t hang off furniture, block the TV or overwhelm your space. Control music, podcasts and more with Amazon Alexa and Siri. Your Sonos Beam must be connected via HDMI ARC to control your TV with Alexa. Sonos and your voice service regularly add new features and skills, so your experience is always improving. Sound for your whole home. Easily connect Sonos speakers in different rooms over WiFi to create a home sound system that brings every room and everyone together. Connecting Sonos Beam to your TV is as easy as plug and play. If you have your device nearby, control Sonos Beam with the Sonos app, AirPlay or your favourite music service’s app. You can also use your voice to control your Sonos with Alexa and Siri. 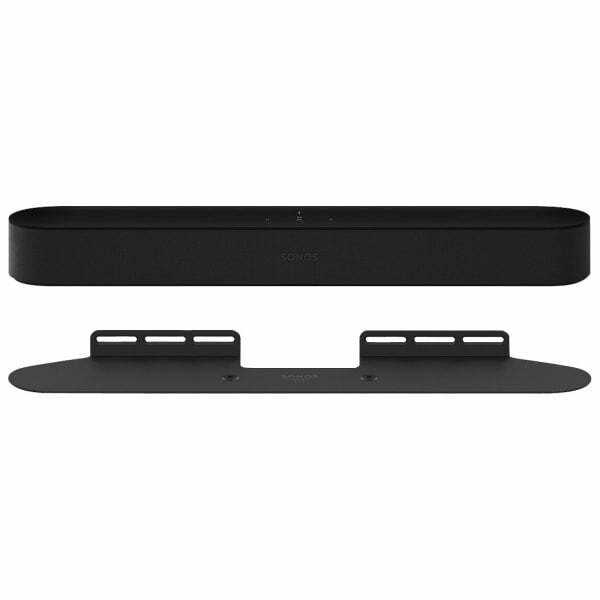 With the Sonos Wall Mount for Beam you will create incredible audio quality from virtually anywhere in a room. This easy-to-install, will securely hold your Beam speaker with a minimal profile frame. Attach your Beam to nearly any spot on the wall without adding unnecessary bulk. Minimal profile frame and black finish matches the coordinating Beam speaker seamlessly, making the mount almost invisible. – Five Class-D digital amplifiers: Perfectly tuned to match the speaker drivers and acoustic architecture. – Five far-field microphone array uses for advanced beamforming and multi-channel echo cancellation. – When the microphone LED is on, Alexa is ready for a voice command. When the light is off, the microphone is off. – HDMI ARC: HDMI Cable connects to your TV’s HDMI ARC input. – Optical Audio: Optical Audio Adapter to connect to your TV. Allows Sonos Beam to support DOLBY DIGITAL and stereo. – Top-panel features: Capacitive touch controls for volume up/down, previous/next track, play/pause, microphone mute. LED indicates status, mute status and voice feedback. – Power supply: Auto-switching 100-240 V, 50-60 Hz AC universal input. – Ethernet port: One 10/100 Mbps Ethernet port. Wire directly to your router to operate your Sonos if WiFi is unstable. – WiFi: Connects to your home WiFi network with any 802.11b/g, 2.4 GHz broadcast-capable router for uninterrupted wireless streaming. Connects directly via rear surrounds or Sonos Sub to 5 GHz broadcast.